A blend of Essential Oils in an Aqua Cream base, producing a unique and satisfying lotion which has been specially formulated to treat minor skin conditions and lesions. Containing Tea Tree Leaf, Lavender Flower and Geranium Flower essential oils, this product has the perfect balance of healing and calming properties. 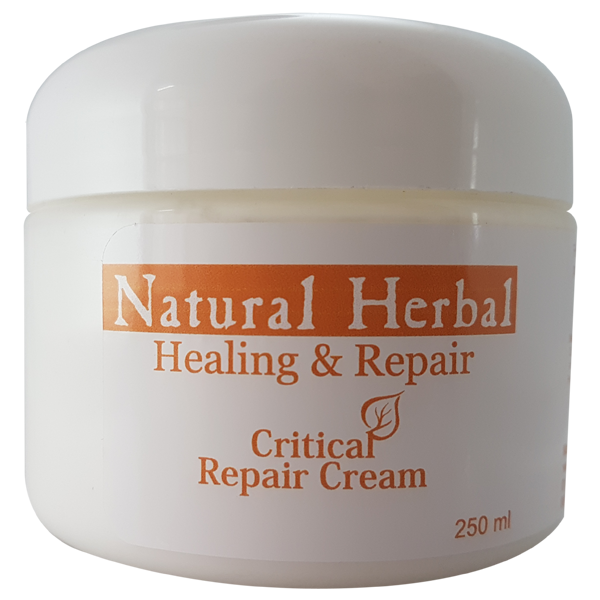 Healing & Repair Range Critical repair cream is uniquely designed to soothe and heal minor skin conditions. It contains Tea Tree Leaf oil which is known to have antibacterial, antifungal and antimicrobial properties, thereby contributing to the general health of the skin. Tea Tree oil also contributes to the healing of broken skin and as it also has strong antioxidant properties, it protects the skin from free radicals. Furthermore it is a sudorific, which means it helps to draw out toxins through the skin. Lavender Flower Oil is known to have a soothing effect on body and soul, reducing inflammation and relaxing the skin. A combination of Geranium Flower and Rosemary Leaf oil helps in tightening the skin, as they are both known for their astringent properties. These oils have this effect by inducing minor contractions in muscles and blood vessels. Rosemary Leaf oil also contains a wide variety of nutrients such as iron, calcium, vitamins and antioxidants, contributing to the rejuvenating of the skin. The addition of Wheat germ oil, containing vitamin B, assists in repairing tissue. It also has anti-aging properties by keeping the skin free of free radicals. Jojoba seed oil has unique moisturising qualities for dry and chapped skin. For the best results, apply all over the body after a warm shower or bath, as the skin pores are open to absorb most of the moisture and healing content contained in this product. Can be used all over, at any time. Leaves skin soft, smooth, refreshed and glowing.